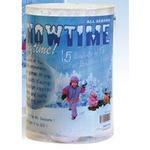 Snowtime Anytime is the only product on the market that allows kids to have wintry, snowy fun anytime they want! These specially designed snowballs are light and fluffy and feel like a real snowball. Soft and safe, they even crunch when you squeeze them! This pack comes with 15 Snowtime Anytime Snowballs in a big clear tub.